Having beautiful hair takes effort, and in order to look their best, women need to purchase hair care products that help their hair look great. 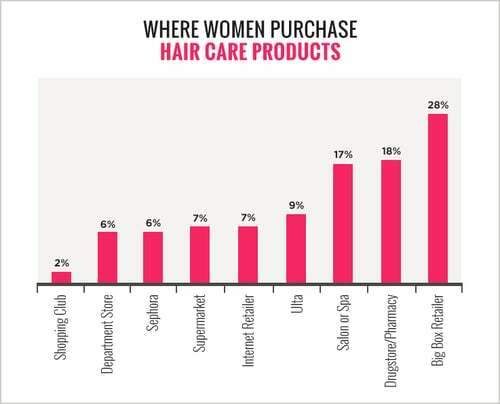 However, there are lots of places where women can purchase hair care products, from their salon to Target or Walmart to buying them online, so as part of the POPSUGAR Insights Q2 2014 beauty study, we asked women to tell us where they most frequently purchase hair care products. Overall, the highest percentage of women in our study purchase their hair care products at a big-box retailer like Target or Walmart (28%). Purchasing at a drugstore or pharmacy ranked second overall (18%), followed by buying hair care products at the salon or spa (17%). Less than 10% of women in our survey went directly to a specific retailer like Ulta (9%) or Sephora (6%), and only 7% of women purchase their hair care products via an Internet retailer like Amazon.com.